It's no secret we have a soft spot for ice cream here. Well, to be honest, we probably have more than a few soft spots from ice cream too. ...and there needs to be one just for us adults, right? Let the kiddies clamor for the chocolate soft serve with rainbow sprinkles. Let's claim us a good ice cream sammich, and a little bonus if it gives us adults a little energy shot too. 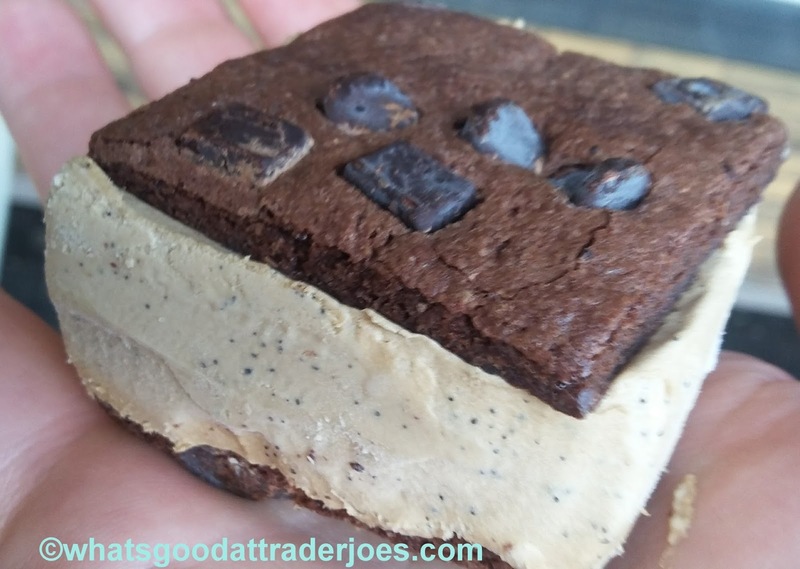 Go get Trader Joe's Brownie Crisp Coffee Ice Cream Sandwiches. Go get them now. They're $3.99 for a four pack, so basically a buck each. There is nothing better you can get, anywhere, for a buck. Challenge me. You won't win. For the record, Powerball tickets, even winning ones, cost $2. In pretty much every conceivable way, these ice cream treats are perfect. There's not a single thing that could be better. Perfect size - palm size, about an inch of ice cream high, with two thin brownie "crisps" playing the bread role. Perfect taste - rich, creamy espresso laced cream. I've had so many "coffee" ice creams that were little more than brown tinted vanilla. So not the case here. Those brownies tho too - legit fudgy flavor with big ol' chocolate chunks in there to add a lot of cocoa oomph. And perfect texture too. The whole bite for these brownie coffee sammiches is flawless. The "crisps" really aren't crispy at all but are instead just rigid enough to hold the whole shebang together while still somehow maintaining a soft, chewey middle in a concoction no more than few millimeters thick. These really are some baking marvels at work with the perfect creamy ice cream with little coffee ground beans sprinkled here and there. Sandy and I busted out the box over the weekend for a small family get-together and all adults agreed: awesome. No complaints at all, just satisfied "mmm"s across the board. And even better yet - none of the kids wanted a bite! Not like we'd share anyways. Nothing to add. Nothing to subtract. Perfect as is, as our score reflects below. It's not us growing soft...except from eating more of these all summer long. Now this is a product I will try!! I didn't see a gluten free label and also didn't review all the ingredients too closely...but if they are in fact gluten free that's a major win! It looks like they are safe for anyone who is not so strict that they need their packaged food to be "certified gluten-free"...I'd eat them with no fear! Damn. These sound good but I usually eat my ice cream at night and I'm thinking coffee is a bad idea. Another seasonal and on-topic tip: TJ's is great for making all sorts of ice cream sandwiches. Pick your favorite TJ ice cream and cookie/brownie/whatever; put a spoonful of ice cream between the sandwich halves and voila! You can make small ones if trying to watch calories, etc. I started these creations with the Fall combo of pumpkin ice cream and triple ginger crisps. P.S. You can also make tasty elongated ice cream sandwiches by putting a chink of your fave ice cream between 2 Kitchen Sink Dunkers! According to the TJs employee I spoke to, these are the TJs "Brownie Crisp" (the vegan, gluten free ones in the blue bag; TJs version of "brownie brittle). And a heads up... These are seasonal... They will be gone soon for how well they are selling. They're already gone in my area, and the TJs employee who checked the computer says they're unable to restock. I picked up the gf Brownie Crisps, and we'll make our own... but I wasn't expecting they'd be gone in June. How i wanna try these! They look amazing and my mouth is already watering! This has been on my to eat list for ages and i just hope and pray that i get to try them soon! So glad these came back in September and seem to be stocked regularly now. I'm one of those "must have dessert" people and chocolate is best. With only 180 calories these hit the spot. I have no complaints about the chewy brownie. The coffee ice cream is smooth and lovely. My only complaint is the chocolate chip bits are hard as little rocks and never do soften up in your mouth. Am not thinking they used honest-to-goodness Toll House chips here. I looked for them last year and couldn't find them after this review. I just bought a box this afternoon and had one perfect size perfect sandwich. Very bold espresso flavor are you will not find anything like this anywhere else.